When he was named leader, Joshua was undoubtedly a bit hesitant. He wasn’t managing a bank or a fast-food restaurant. He wasn’t leading a sports franchise. He wasn’t taking over a family business. He wasn’t even becoming a CEO of a nationally known corporation. Instead, he was assuming leadership of a brand new nation encompassing millions of people who had no land, no formal government, and no clear direction other than a cloud they followed. Joshua was probably a bit fearful. He needed some direction. These were powerful words. Joshua took them to heart, and he was successful (read to the end, “success” might not mean what you think it means). What do you like talking about? I love to talk about the things that are important to me. You don’t have to be around me long to hear me talking about my wife or my children. Probably if you listen long enough, you’ll hear me talk about sports, particularly golf. I’ll talk your ear off with my thoughts on church, Christianity, and theology. The things about which I’m excited are the things which won’t depart from my mouth. God told Joshua to not let the words of Scripture depart from his mouth. If God’s Word was the most important thing in Joshua’s life, then Joshua would be successful. I remember when my wife was pregnant with our first child. Many nights I would run out in the middle of the night for a bean burrito. I was just glad Taco Bell was open all night! Women who have been pregnant can sympathize with my wife. While I’ve never had those types of cravings, I have plenty of my own obsessions. I hate being late, so I am always paying attention to the clock. During baseball season, I give more than an appropriate amount of attention to the Detroit Tigers. When I am preparing for an important presentation, I obsess about the details. I’ll spend day and night meditating on the words I’m going to use. James 1 contains a brief parable about a man who wakes up in the morning, checks himself out in the mirror, and begins his day without making any adjustments. A mirror’s purpose is to point out the elements of our appearance which need correction. The benefit of looking in the mirror is lost if a person chooses not to act according to the information obtained. James’ used his story to challenge people not to “merely listen to the word”, but to “do what it says”. God did not want Joshua to simply accumulate and think about the information contained in Scripture. 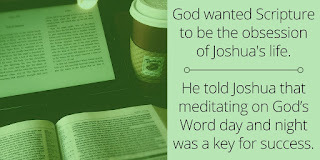 He wanted Joshua to “be careful to do everything written in it.” Success for Joshua would be accomplished by acting upon the information he discovered in God’s Word. Many people read God’s promise to Joshua and begin salivating at the prospect of a simple formula which will lead to prosperity and success. Such excitement is often based on a misunderstanding of these two concepts. Prosperity is relative. For every person you can find who is more “prosperous” than you, likely just as many exist who are less “prosperous” than you. Success is a perception. Almost everyone is successful in someone’s eyes (even if it is just your parents!). The reality of success is dependent on the standard used to measure success. Everyone is successful in someone’s eyes. 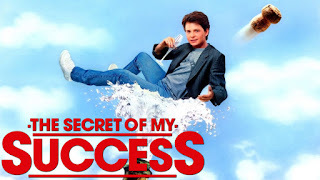 In whose eyes are you successful? Joshua was certainly not successful or prosperous in many people’s eyes. Very few accounts exist of his individual exploits. No record can be found regarding the extent of his wealth or possessions. He is remembered as much for his great defeats and mistakes (Ai and Gibeon) as he is for his victories (Jericho). His is a good story, but certainly not a “great” story. Everyone is successful in someone’s eyes. Joshua’s success as a leader was in the eyes of God. Joshua never let the Word of God depart from his mouth. 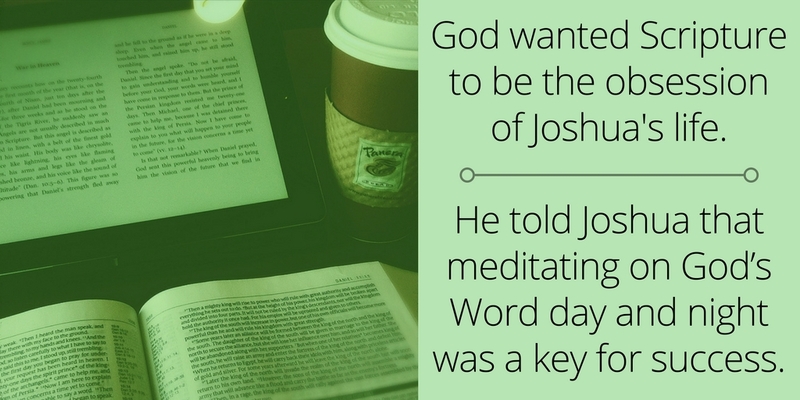 Joshua never stopped meditating on God’s Word. Joshua was careful to do all God’s Word commanded.